I've had great success with peppers last year and in the process produced some pretty awesome hot sauce, so I've decided to expand next year. Last year I grew 7 Jalapenos, 4 Blazing Bananas, 6 Poblanos and about 6 belll peppers. The jalapenos, though very productive, only grew about 3 feet tall and produced fairly small jalapenos. The blazing bananas (which are a hungarian wax/sweet banana hybrid) were super-productive, they were loaded with peppers the entire summer. The jalapenos and bananas made for a good base for hot sauce, but once you add the vinegar it tones them down and it's not quite hot enough. Had to supplement with copious amounts of ground cayenne pepper to get it to where it needed to be. I also added onions, garlic and two pears to the sauce, it's just fantastic on wings. For next year, I plan on growing hungarian wax, a bunch of cayenne bushes, a few habaneros and a couple ghost chilis to bring up the heat. What do you folks grow? Any highly productive varieties you would recommend - both hot and sweet? This year I did cubanelle peppers. I found them at home depot Bonnie plants. They were great for cooking and it produced like crazy from two plants. I like to use serrano or scotch bonnet for heat. I have grown mostly bell peppers and jalapenos. But 2 years ago I grew ghost peppers as well. For me I am becoming a real chillihead, and the hotter the better. My wife and I have been discussing the right location for a garden at our new house. We had one at our old house but had to wait a year in this one to see where the sun hits during the summer. I like to grow what I call my Salsa Garden. I usually grow jalapeños, bell peppers, banana peppers, tomatoes, onions, and cilantro. We also do lettuce, cucumbers, and sometimes okra. I’ve had mixed results with the peppers over the years. It seems like I can’t ever get them all to do well the same year. There is nothing better than making homemade salsa from fresh picked veggies. I may have to try making homemade hot sauce. I’d be interested in seeing some recipes. i've had the same 3 jalapeno plants for going on 3 or 4 years. This last year was the first year i had them planted in a raised bed and they produced more jalapenos than I thought they would. I'm excited to see their production this year as they've produced more and more each year. My last harvest had over 70 jalapenos. I even had a few minor set backs during the season with tomato horned worms destroying the plants down the the stems. I'll probably get an additional plant either bell or poblano this season and see how it does. Last edited by Kicker on Thu Jan 31, 2019 3:44 pm, edited 1 time in total. I got an early start this year! Thus far I have 4 ghost peppers, 6 habaneros, 10 Jalapenos, 10 Cayenne and 7 New Mexico. They were all seeded at exactly the same time, but grew very differently. 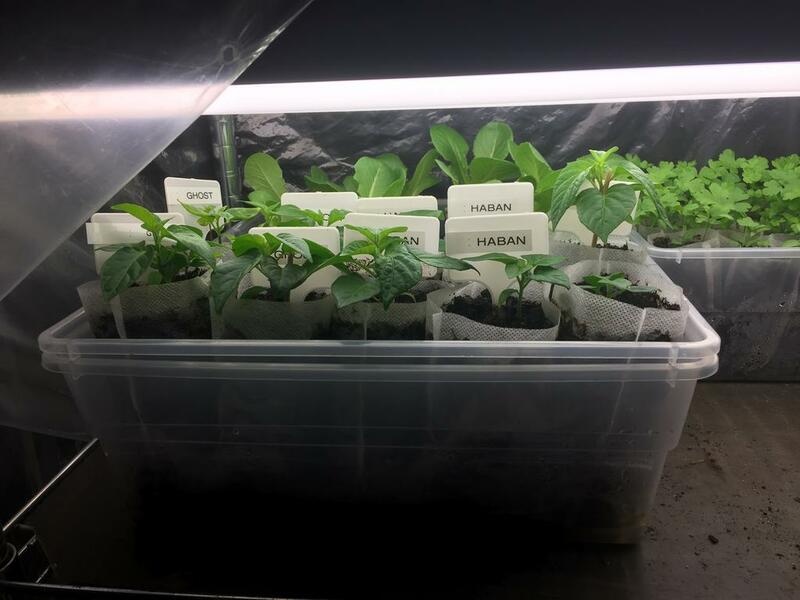 The New Mexico peppers just took off - so much that I've had to repot them, followed by the Jalapenos, the Cayenne, and a distant last the superhots which took close to 40 days to germinate and have been growing very slowly since. 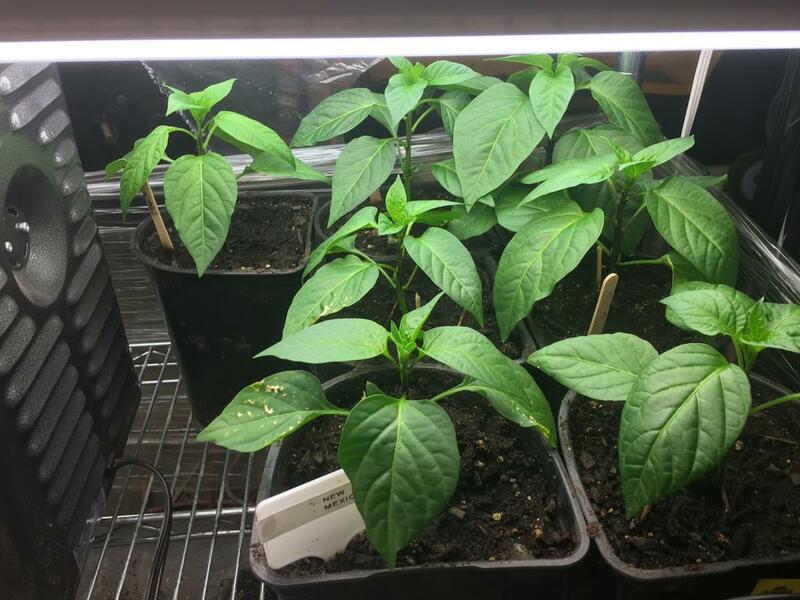 If you're thinking of growing superhots from seed and haven't done so yet, better get them going right now. The setup is a 48" 5-shelf stainless steel rack from Sams Club with 3 x dual T8 shop lights on each level. 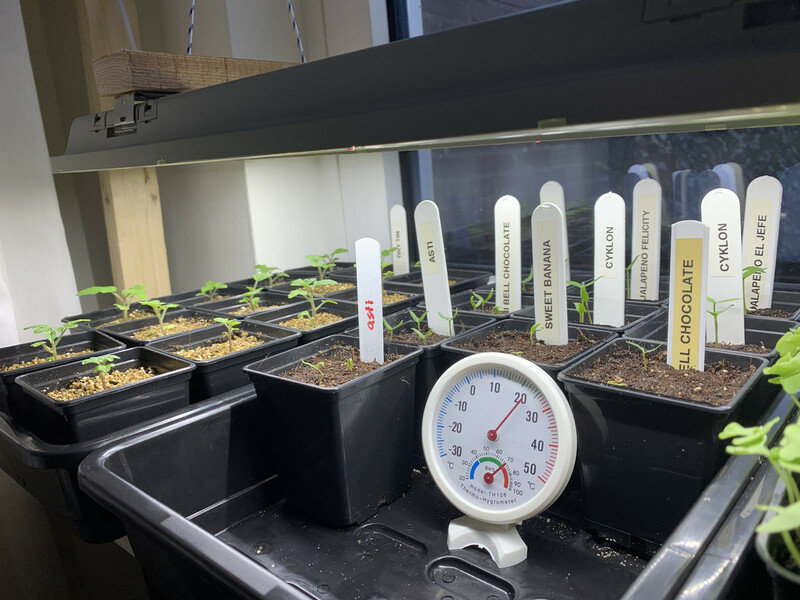 The distance between shelves gets progressively larger so the plants start at the top and move down as they grow, always staying about 3" from the lights. I also have an Inkbird temperature controller hooked up to a space heater to keep the temp at around 65. 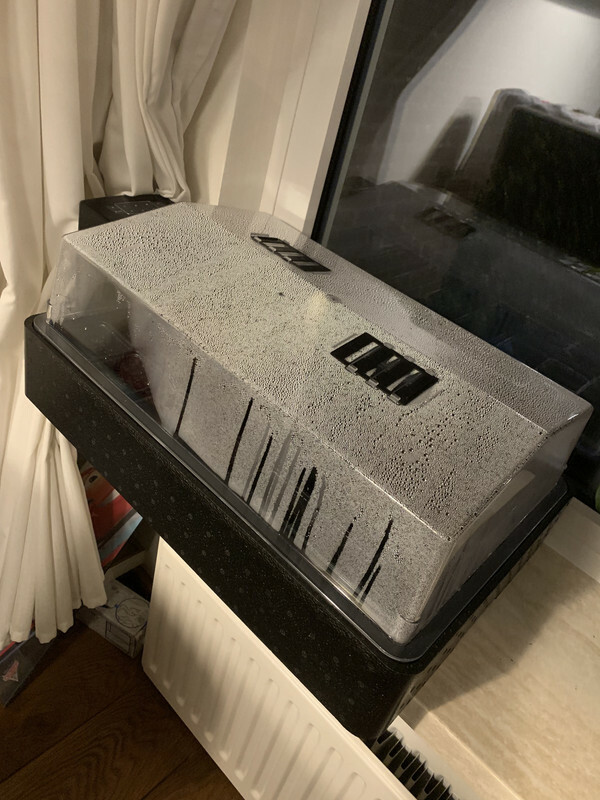 I have another small greenhouse indoors where I start seed. I keep this one at about 80 degrees - it's easier to maintain 80 from indoor temp as base. I also started parsley, dill, onions, 10 eggplants and about 16 heads of lettuce. I will start another batch of lettuce shortly and every 3 weeks thereafter. Early March I will be seeding a bunch of sweet peppers, tomatoes and basil. Anything else will be sown straight into the ground. 40 days to germinate? I would have gave up on them. I plan on doing a couple cherry tomatoes ( my 3 yo will eat everyone of them) a couple larger tomatoes for salsa and slicers, a couple of jalapeños and a habenaro. There may be more but that’s the plan for now. 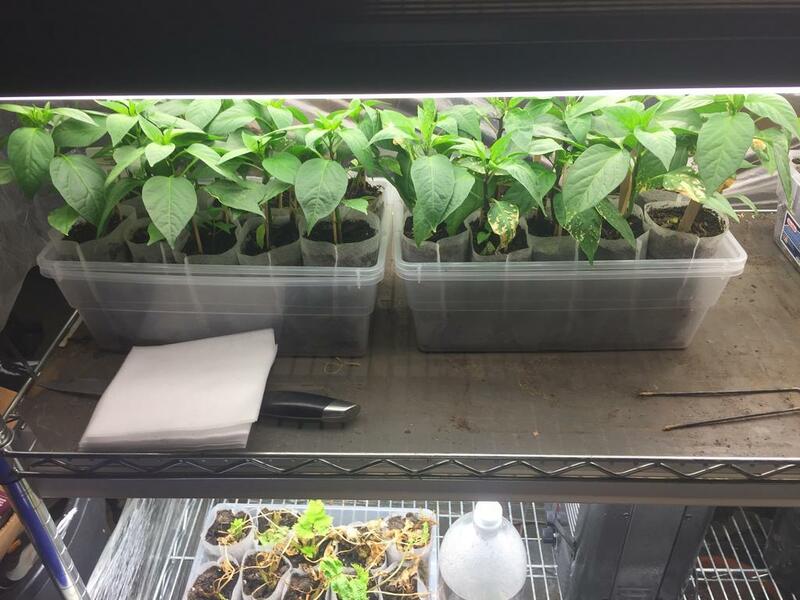 Unfortunately the capsicum chinense species (which includes all the superhot varieties - habanero, ghost pepper, the scorpions and the 7 pots including the Carolina Reaper) is famously slow to germinate and grow from seed. I will probably try to overwinter a few of them indoors next winter. I always have what my friends refer to as a "salsa garden". Tomatoes, peppers, cilantro, tomatillos and onions. I prefer habaneros and should have 8-10 plants, then jalapeno with another 8-10 and then I find something interesting to play with. Have grown scotch bonnets, ghost, reapers, scorpions etc. Probably going to grow some more ghost this year, haven't grown them in several years and I kinda think I like them better than most of the other "hot" peppers. only 2-3 plants of those and I will be giving a bunch away! We don't make much hot sauce but we do like to make habanero gold pepper jelly. It is really good. Most of the rest I use in smoked sausage that we make each year from our venison. The rest will be diced up and frozen in individual serving sized bags and be used year round in chili, tacos and the like. You look to be way ahead of the game, those plants look great! Last year I overwintered two Carolina Reapers indoors that I had purchased directly from Smoking Joe at Puckerbutts in 2017. They got over 6 feet tall last summer, but I lost them both this winter. I use them mostly for making deer and rabbit repellent spray. I never had much luck with jalapenos, they keep getting eaten before getting picked, I think by mice. Last edited by Miggity on Tue Feb 12, 2019 8:55 pm, edited 1 time in total. How tall did the Reapers get the first year? Probably close to 3 feet. The stems were much weaker the first year, so I had some losses due to branch breakage. The second year the stems were about the size of a nickle. Thank you. Trying to do a better job of placement this year as the Poblanos got over 6 ft tall last year and shaded everything behind them. This is my first time growing the chinese varieties. The foliage on the young plants looks very different from the other peppers, so I expect they'll behave differently. A lot of the pepper varieties benefit from being "topped" - trimming the main leader to stimulate lateral branch growth. Did you find that to be the case with the Reapers or do they naturally have a lot of lateral growth? 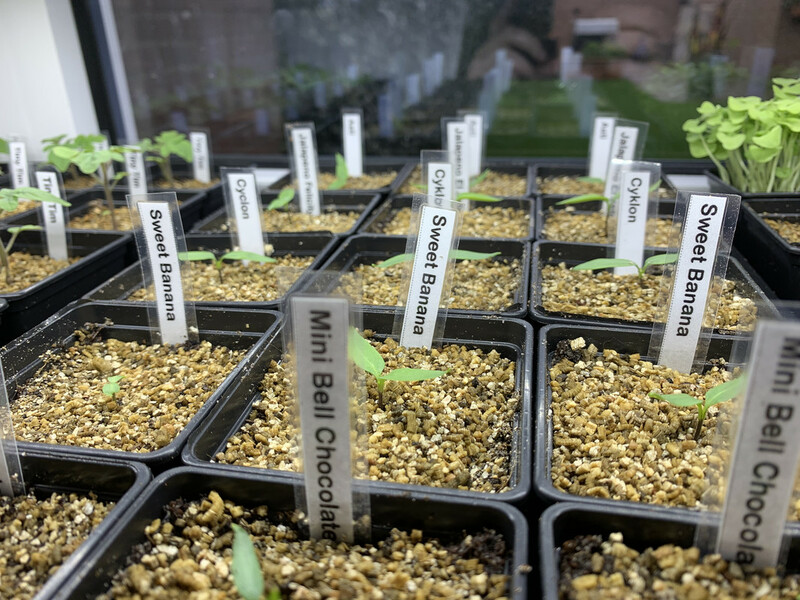 I top all of my pepper plants three times over the course of 3-4 months before planting them in the ground, so I cannot comment on their 'natural' lateral growth. I can tell you that in the first year they outgrew the largest 'normal' tomato cages available locally. I would say they branched about the same as a California Wonder bell pepper, just on a larger scale. I give them about four feet between plants and the branches will touch each other by the end of my season which is shorter than your own. Has anyone thought about the use of PGR on pepper plants? The thought crossed my mind but I am not sure about using it on fruit/vegetable crops. Can anyone chime in on this? would it have the same effect as topping? increase the bushy-ness of the plant causing more nodes for fruit/vegetables to sprout from? Last edited by Kicker on Thu Feb 21, 2019 4:36 pm, edited 1 time in total. There are like 5 different types of PGRs. Some are food grade stuff (you plan to eat the peppers, right?). There are also pgr for shrubs and landscape plants. I think that's a totally different ballgame when it comes to stuff you're going to eat. Personally I try to keep pesticides away from the garden if possible. Sometimes it can't be helped - there's these little bugs that punch thousands of little holes into my eggplant leaves and I have to spray for those or the plant dies. This is my first year growing peppers. 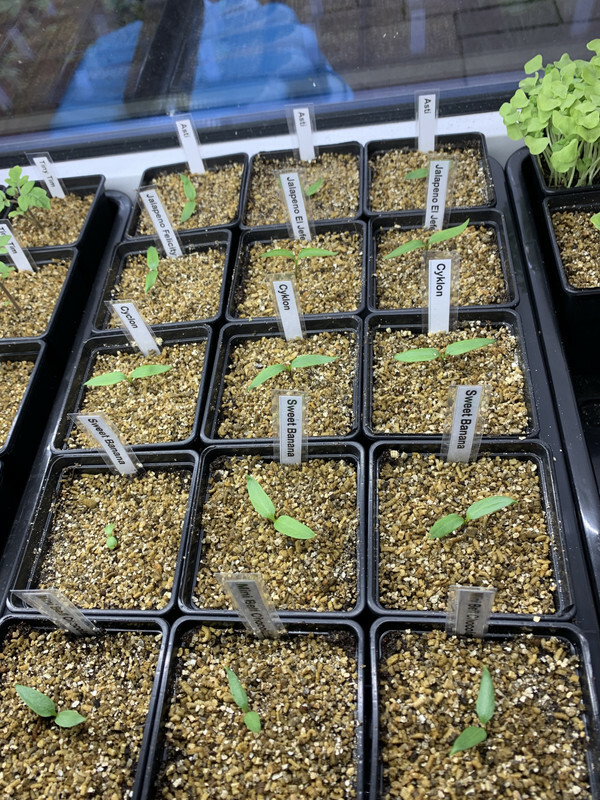 Seeded them 3 weeks ago in a heated propagator. When they germinated i putt them under light. Now they are growing great!